Scotch-Irish says Leyburn, "is an Americanism, generally unknown in Scotland and Ireland, and rarely used by British historians." It is "The more usual term in North America" says the Oxford English Dictionary, which gives it a score of 3/8 in terms of current usage. It became common in the United States after 1850. The term is somewhat ambiguous because some of the Scotch-Irish have little or no Scottish ancestry at all: numerous dissenter families had also been transplanted to Ulster from northern England, in particular the border counties of Northumberland and Cumberland. Smaller numbers of migrants also came from Wales and the southeast of England, and others were Protestant religious refugees from Flanders, the German Palatinate, and France (such as the French Huguenot ancestors of Davy Crockett). What united these different national groups was a base of Calvinist religious beliefs,  and their separation from the established church (the Church of England and Church of Ireland in this case). That said, the large ethnic Scottish element in the Plantation of Ulster gave the settlements a Scottish character. The word " Scotch" was the favored adjective for things "of Scotland", including people, until the early 19th century, when it was replaced by the word "Scottish". People in Scotland refer to themselves as Scots, as a noun, or adjectivally/collectively as Scots or Scottish. The use of "Scotch" as an adjective for anything but whiskey has been out of favor in the U.K. for 200 years[ citation needed], but remains in use in the U.S. in place names, names of plants, breeds of dog, a type of tape, etc., and in the term Scotch-Irish. In September 1723, Rev. George Ross, Rector of Immanuel Church in New Castle, Delaware, wrote in reference to their anti- Church of England stance that, "They call themselves Scotch-Irish... and the bitterest railers against the church that ever trod upon American ground." Fischer prefers to speak of "borderers" (referring to the historically war-torn England-Scotland border) as the population ancestral to the "backcountry" "cultural stream" (one of the four major and persistent cultural streams from the Ireland and Britain which he identifies in American history). He notes the borderers were not purely Gaelic but had substantial English and Scandinavian roots. He described them as quite different from Gaelic-speaking groups such as the Scottish Highlanders or Irish (that is, Gaelic-speaking and Roman Catholic). The first major influx of Scots and English into Ulster had come in 1606 during the settlement of east Down onto land cleared of native Irish by private landlords chartered by James. This process was accelerated with James's official plantation in 1609, and further augmented during the subsequent Irish Confederate Wars. The first of the Stuart Kingdoms to collapse into civil war was Ireland where, prompted in part by the anti-Catholic rhetoric of the Covenanters, Irish Catholics launched a rebellion in October. In reaction to the proposal by Charles I and Thomas Wentworth to raise an army manned by Irish Catholics to put down the Covenanter movement in Scotland, the Parliament of Scotland had threatened to invade Ireland in order to achieve "the extirpation of Popery out of Ireland" (according to the interpretation of Richard Bellings, a leading Irish politician of the time). The fear this caused in Ireland unleashed a wave of massacres against Protestant English and Scottish settlers, mostly in Ulster, once the rebellion had broken out. All sides displayed extreme cruelty in this phase of the war. Around 4000 settlers were massacred and a further 12,000 may have died of privation after being driven from their homes. The number of native Irish that died as a result of the Scottish colonisation is over 1,000,000, other estimations are higher. This caused Ireland's population, combined with the Irish catholic refugees fleeing to drop by 25%. William Petty's figure of 37,000 Protestants massacred... is far too high, perhaps by a factor of ten, certainly more recent research suggests that a much more realistic figure is roughly 4,000 deaths. In one notorious incident, the Protestant inhabitants of Portadown were taken captive and then massacred on the bridge in the town. The settlers responded in kind, as did the British-controlled government in Dublin, with attacks on the Irish civilian population. Massacres of native civilians occurred at Rathlin Island and elsewhere. In early 1642, the Covenanters sent an army to Ulster to defend the Scottish settlers there from the Irish rebels who had attacked them after the outbreak of the rebellion. The original intention of the Scottish army was to re-conquer Ireland, but due to logistical and supply problems, it was never in a position to advance far beyond its base in eastern Ulster. The Covenanter force remained in Ireland until the end of the civil wars but was confined to its garrison around Carrickfergus after its defeat by the native Ulster Army at the Battle of Benburb in 1646. After the war was over, many of the soldiers settled permanently in Ulster. Another major influx of Scots into Ulster occurred in the 1690s, when tens of thousands of people fled a famine in Scotland to come to Ireland. A few generations after arriving in Ireland, considerable numbers of Ulster-Scots emigrated to the North American colonies of Great Britain throughout the 18th century (between 1717 and 1770 alone, about 250,000 settled in what would become the United States). According to Kerby Miller, Emigrants and Exiles: Ireland and the Irish Exodus to North America (1988), Protestants were one-third the population of Ireland, but three-quarters of all emigrants leaving from 1700 to 1776; 70% of these Protestants were Presbyterians. Other factors contributing to the mass exodus of Ulster Scots to America during the 18th century were a series of droughts and rising rents imposed by often absentee English and/or Anglo-Irish landlords. 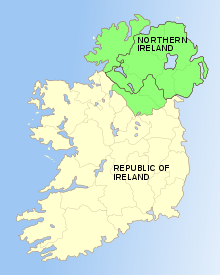 During the course of the 17th century, the number of settlers belonging to Calvinist dissenting sects, including Scottish and Northumbrian Presbyterians, English Baptists, French and Flemish Huguenots, and German Palatines, became the majority among the Protestant settlers in the province of Ulster. However, the Presbyterians and other dissenters, along with Catholics, were not members of the established church and were consequently legally disadvantaged by the Penal Laws, which gave full rights only to members of the Church of England/ Church of Ireland. Those members of the state church were often absentee landlords and the descendants of the British aristocracy who had been given land by the monarchy. For this reason, up until the 19th century, and despite their common fear of the dispossessed Catholic native Irish, there was considerable disharmony between the Presbyterians and the Protestant Ascendancy in Ulster. As a result of this many Ulster-Scots, along with Catholic native Irish, ignored religious differences to join the United Irishmen and participate in the Irish Rebellion of 1798, in support of Age of Enlightenment-inspired egalitarian and republican goals. Scholarly estimate is that over 200,000 Scotch-Irish migrated to the Americas between 1717 and 1775. As a late arriving group, they found that land in the coastal areas of the British colonies was either already owned or too expensive, so they quickly left for the more mountainous interior where land could be obtained cheaply. Here they lived on the first frontier of America. Early frontier life was extremely challenging, but poverty and hardship were familiar to them. The term hillbilly has often been applied to their descendants in the mountains, carrying connotations of poverty, backwardness and violence; this word has its origins in Scotland and Ireland. Author and U.S. Senator Jim Webb puts forth a thesis in his book Born Fighting (2004) to suggest that the character traits he ascribes to the Scotch-Irish such as loyalty to kin, extreme mistrust of governmental authority and legal strictures, and a propensity to bear arms and to use them, helped shape the American identity. In the same year that Webb's book was released, Barry A. Vann published his second book, entitled Rediscovering the South's Celtic Heritage https://www.abbevilleinstitute.org/blog/is-the-south-celtic/. Like his earlier book, From Whence They Came (1998), Vann argues that these traits have left their imprint on the Upland South. In 2008, Vann followed up his earlier work with a book entitled In Search of Ulster Scots Land: The Birth and Geotheological Imagings of a Transatlantic People, which professes how these traits may manifest themselves in conservative voting patterns and religious affiliation that characterizes the Bible Belt. Many Presidents of the United States have ancestral links to Ulster, including three whose parents were born in Ulster. The Irish Protestant vote in the U.S. has not been studied nearly as much as that of the Catholic Irish. In the 1820s and 1830s, supporters of Andrew Jackson emphasized his Irish background, as did James Knox Polk, but since the 1840s it has been uncommon for a Protestant politician in America to be identified as Irish, but rather as 'Scotch-Irish'. [ original research?] In Canada, by contrast, Irish Protestants remained a cohesive political force well into the 20th century, identified with the then Conservative Party of Canada and especially with the Orange Institution, although this is less evident in today's politics. More than one-third of all U.S. Presidents had substantial ancestral origins in the northern province of Ireland (Ulster). President Bill Clinton spoke proudly of that fact, and his own ancestral links with the province, during his two visits to Ulster. Like most US citizens, most US presidents are the result of a " melting pot" of ancestral origins.